Five characters (and their guests) in search of something. 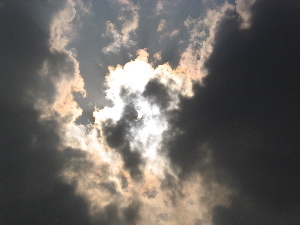 A few shots of our observance of the latest solar eclipse combined with some Oaxaqueno cloud studies. 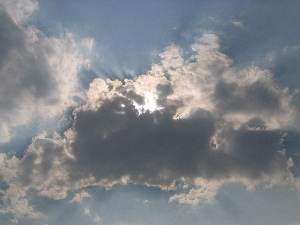 You'll find the sun in the middle of the above photos, behind the clouds. Kept hoping I wasn't going to burn out the CCD. I didn't. 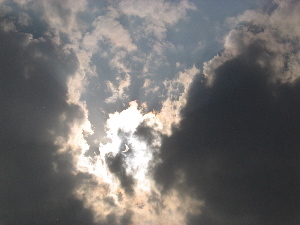 These were the clouds preceeding the eclipse and following the eclipse. 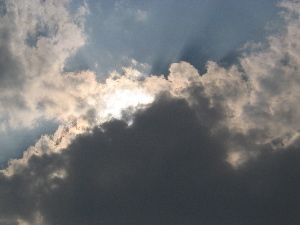 In some ways more appealing than the eclipse itself. 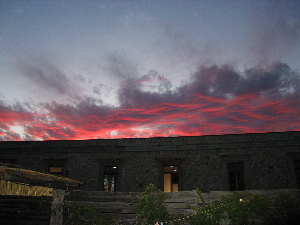 An example of the incredible sunsets of winter in valley of Oaxaca. 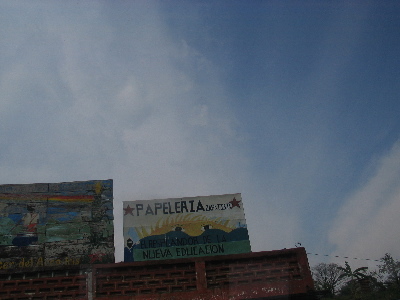 There is a great deal of folksy sign painting happening in Mexico. A "Reservoir Dogs"-like reference by Vain and a Benito Juarez updated for the punk rock generation. 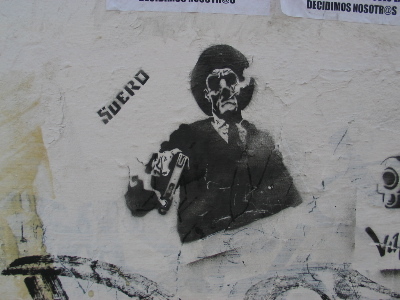 A stencil by Suero with an independent comic book feel (like "Transmetropolitan"). 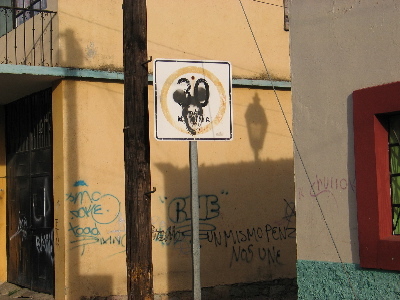 A merger of George Bush (fils) and Mickey Mouse on a slow sign. 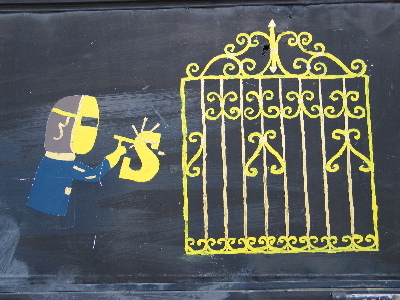 Filled with allegory. 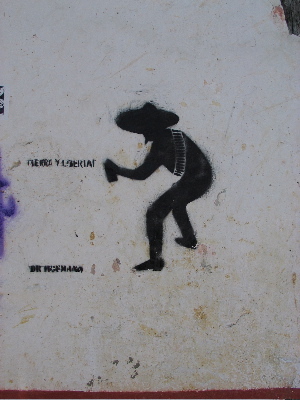 "Tierra y Libertad" by Dr Hofmann. 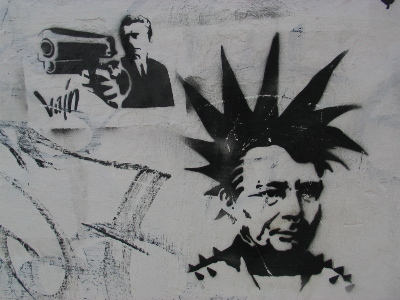 Brilliant piece comparing graffiti artists to Mexican revolutionaries. Some would agree. 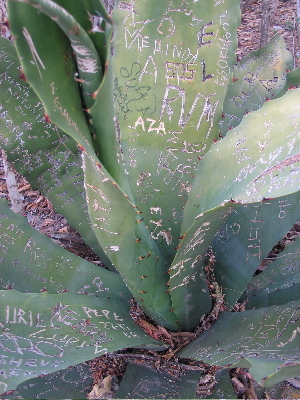 Several large agaves are dying due to the scratched in names of students visiting Hierve el Agua, in the mountains outside Oaxaca Cd. 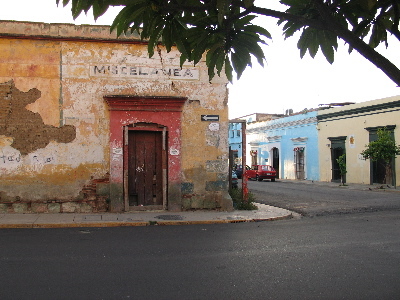 Our closest building in mal estado. Ripe for new works. 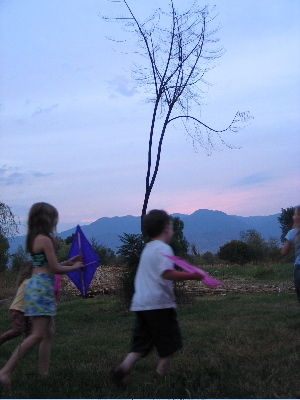 Yesterday Kelsie, Ella, Muriel, Leland and myself had a fantastic visit out to Zaachila, which is a small town about a half hour outside of Oaxaca. 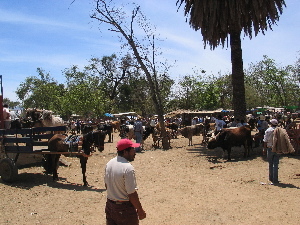 First, we spent a couple of hours out at the livestock market which is on the outskirts of the town. It was truly incredible--none of us had ever seen anything like it. 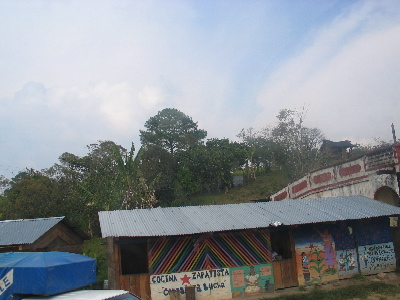 When we first got out of the taxi, we managed to wander into an area that was selling nothing but firewood and charcoal. 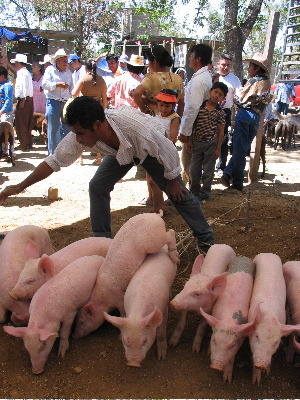 We thought that perhaps we'd missed the livestock market, so wandered a bit. There were a couple of carts with burros braying loudly which provided a some entertainment, but still not what we were seeking. 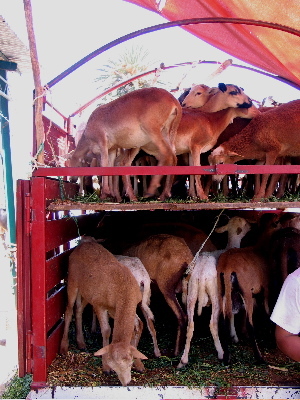 After asking a couple of people, we found our way around a corner and down the street to the sought after livestock market. 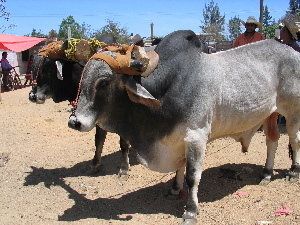 Upon entering, a brahmen bull got loose, sending several people, including us, scattering out of harms way. And so the adventure began. 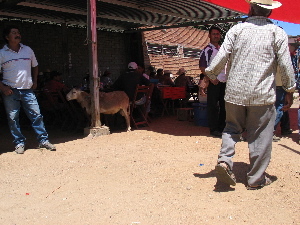 We wandered slowly between the perimeter of where the bulls were and the comedors (small eateries) where barbacoa de chivo (barbecued goat) was being served. 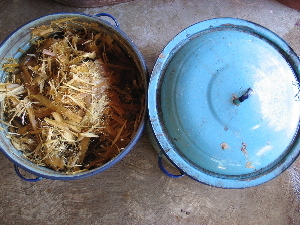 One woman gave me a taste as I admired the contents of her cooking pot. Delicious! 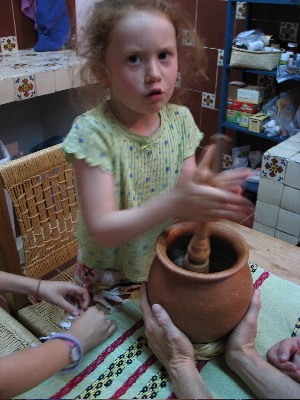 Everything goes into the pot--organs, head, etc. Just at the end of the covered area that had all the comedors were the goats and sheep, and beyond them the pigs. Behind the bulls were a few burros and rather sad and bedraggled looking horses. 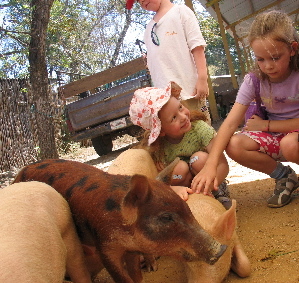 There were also a few random bunnies, which the children particularly enjoyed. 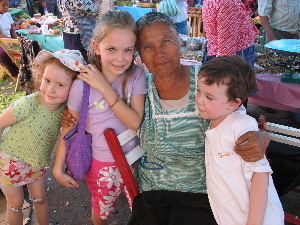 We were the only foreigners in the whole market, so were a bit of a novelty. Everyone was, as usual, incredibly kind and warm. After our wandering, we sat and had tacos de barbacoa de chivo which were great. It was a bit strange to be eating goat and being steps away from the live kind... The kids found the meat too spicy, so had deep fried quesadillas with epazote (a much used herb) and flor de calabaza (squash blossoms)--very greasy and quite yummy. After our lunch, we walked out to the main road and got a motorcycle taxi to the center of town, where there was a large and very crowded market going on. It was a little daunting with the kids in tow, and the heat coming on full force, but we managed to enjoy ourselves. 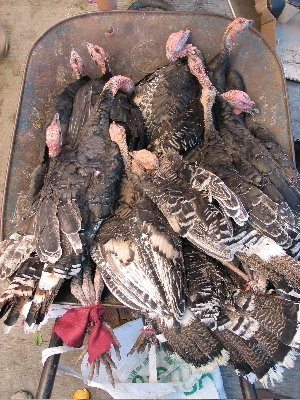 We found some little classic Oaxacan baskets to use as Easter baskets for the kids, had some fresh fruit, saw lots of turkeys panting in the heat, and made a friend with one of the turkey vendors. After the crunch of the market, we went across the street to get a peak at the church, and get an overview of the market. 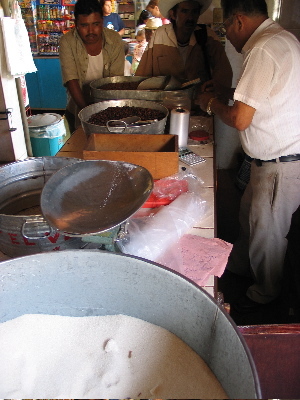 We also found a molino (grinding store) to buy some freshly ground mix for making hot chocolate (or mole...). 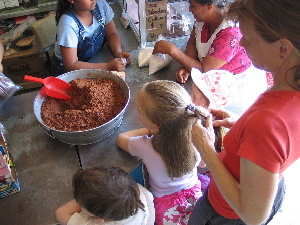 It was great to watch people choosing their particular amounts of cocoa, cinnamon and sugar, then seeing it ground. 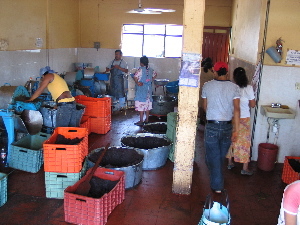 There were also tremendous vats of mole. 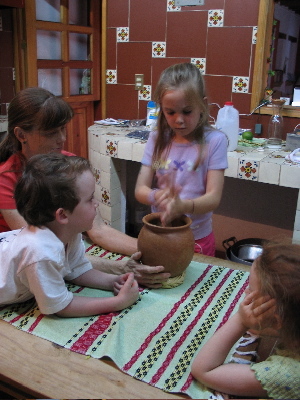 The children loved tasting the freshly ground, still warm, chocolate mix. Making hot chocolate later in the day. 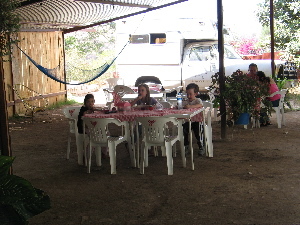 We finished the day eating tacos at our favorite stand in the Parque Llano. All in all a grand day. It was Kelsie and Ella's last day, and I think quite a memorable send off. 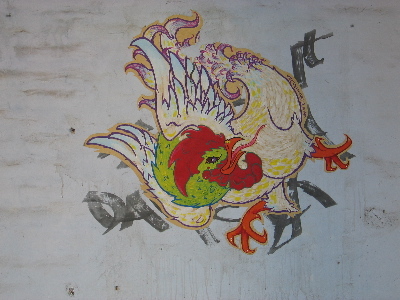 March is here, the weather is heating up, visitors are pouring in, and the end of our time in Oaxaca seems to be spiraling closer at an alarming speed. Ann Hatch and Paul Discoe left yesterday morning after a fun four day visit. Saturday was spent out in San Augustine de Etla, where we toured the paper factory, the upcoming art school, and visited with our friends Marietta and Antonio. 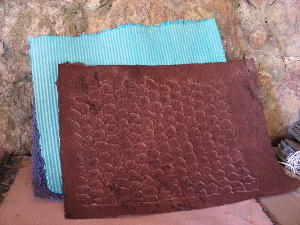 The paper factory, which is one of Francisco Toledo's many projects, is amazing--beautiful textures and colors in a gorgeous setting. 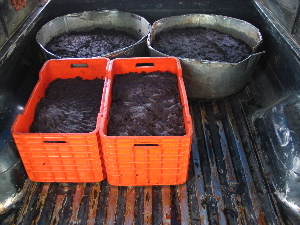 These are some of the raw materials used to make the paper. 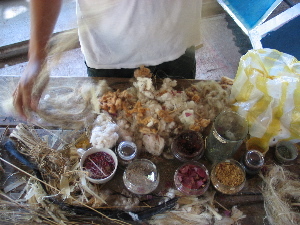 Here are some fibers being prepared to turn into paper. 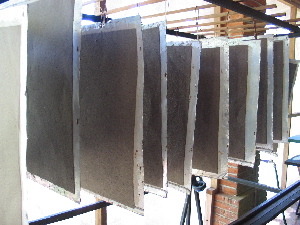 This is how the paper is dried. A few examples of the finished product. The future art school there is another Toledo project. The scale of the building is incredible. 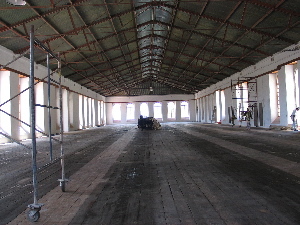 This is the main upstairs space. 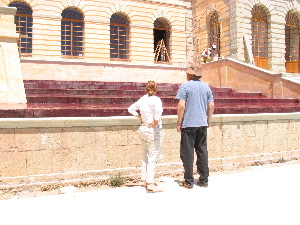 Ann and Paul admiring the cochinile dyed water that runs down either side of the main stairway. After visiting the paper factory and school, we went with Marietta and Tony to a little eating spot up the street from their amazing new house. 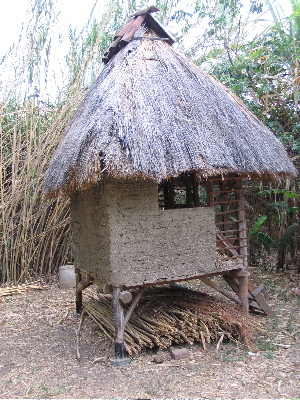 The food was incredibly delicious, and the environment unsurpassed. This is a banana tree flower at Rachel and Eric's. 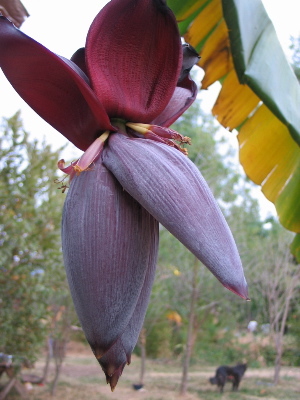 There are many banana trees putting out these incredible blooms at the moment. Amazing to see, particularly considering the lack of water right now. This is the tree house for Eric and Rachel's daughters Luli and Zea. 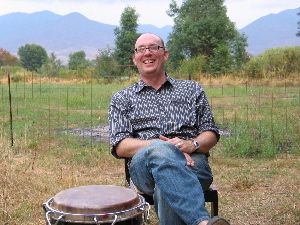 And, finally, yes the impossible occurred: Thom took part in a drum circle. Well, he looks pretty happy for it. And so now...Tonight Matt and Ella arrive--Thursday Kelsie joins up with all of us. Thom's film "Stray" is showing tomorrow night at a little bar in town. He's very excited. Alta and her friend Jeri, who arrived Saturday night from Minneapolis, left today for a 5 day journey to Chiapas. 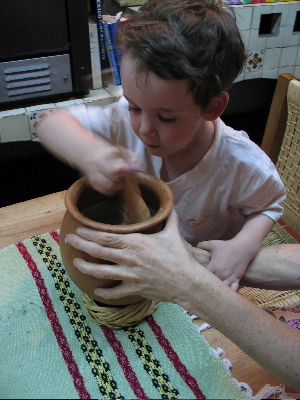 Thom and I are going to follow suit and go on our own to Chiapas after Easter while Alta takes care of M. and L.(first time since before Muriel that we've been off on our own!). We'll try and keep all the adventures posted! The night before we left for our week in New York (visa renewal and seeing The Gates as our major excuses), we went with our friends David, Elizabeth and Leila to the Circo Franzatti/Rudy Brothers Circus. It's been I don't know how long since I've been to a "traditional" circus, and this one proved to be quite exceptional in it's starkness, it's frayed edges, it's sweetness. We all had a tremendous time, and following it I kept thinking how much I would have loved to take photos of the show, and of the participants. They didn't allow any photos to be taken during the show, and the only photo that I did take, of the ticket taker, I liked the look of. We were under the impression that the circus was only going to be in Oaxaca for a week, and since we were leaving for New York early the next day, I attempted to put the whole notion of photographing the circus and it's participants out of my mind. 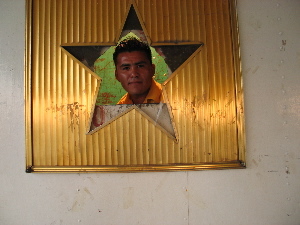 After all, I very rarely photograph human subjects, so, while intriguing, I could easily dismiss the idea. 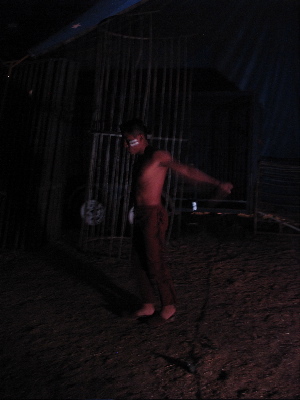 When we returned from New York, we were all surprised to find out that in fact the circus was still here. 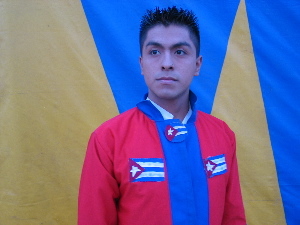 Last Friday morning I went out to ask permission to return during the evening to take photos of the circus entertainers. As I spoke with Uri, the man who works with the lions, in the shade of one of the tractor-trailers we heard the male lion roaring. When I commented on the magnificence of the sound, he asked if I'd like to come over and see the animals. Duh. A half hour later I left the circus area having pet 2 nine month old tigers and been in very close proximity to lions, baboons, a zebra, camels and so on. I also had a very warm invitation to return that evening to take photos. I arrived at 5:30 with a box of cookies and a large bottle of mezcal as offerings. Kilma and Abril are both 14 years old. Abril will turn 15 on April 5th (I have to assume she was named for the month she was born into) Quince años (15 years) is a big rite of passage for young women here in Mexico--it's seen as the passage into womanhood. 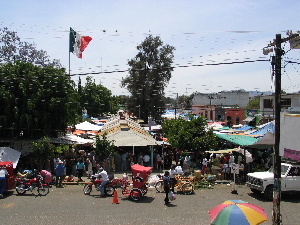 She has extended an invitation to me to attend her quince años party which will be held in a town about 45 minutes from Oaxaca. I think they are also planning on doing a special circus that evening in celebration. Abril at the popcorn stand. The evening was a tremendous experience for me. 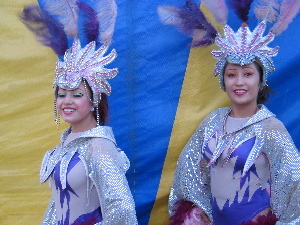 The performers all worked so incredibly hard, and were so determined to give a good show to the spectators. 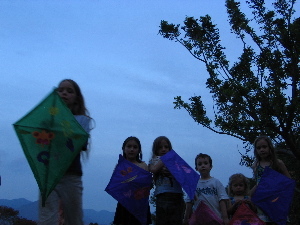 And, they could not have been kinder to me--I felt like a rock star... They invited me to come and see the show with my family on Sunday, which I took them up on. Thom, the kids, Alta, plus our friend Elizabeth and daughter Leila all saw the early show on Sunday (11:30 am), and then were invited to join them for lunch. By the time we left around 3:30, Muriel and Leland were wanting to start their training to be in the circus. 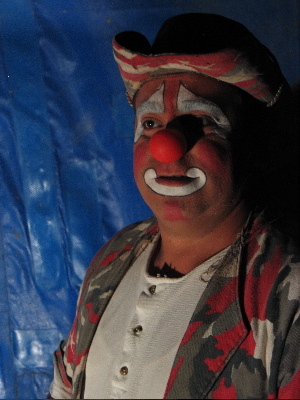 Leland is still talking about his friend Diego, and both kids are still going on about Pepinato the clown (who is VERY funny--clowns are a big part of Mexican culture, and tread a line between stand up comic and clown). Fabian warming up. He's 15 years old. When he was 11 he fell and broke his femur and his hand. It took him a while to overcome his fear, but he now gives a beautiful and commanding performance. 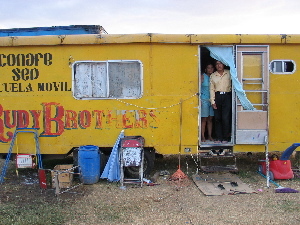 Couple in their trailer. This is also where the classroom is. I am not sure what role the couple play in the functioning of the circus. I went out Tuesday morning for a final goodbye, as they had given their last performance in Oaxaca on Monday night and were packing up to go to the next town. 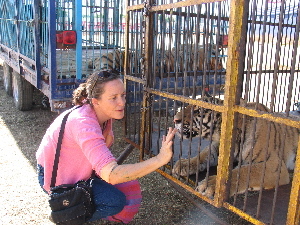 Areli, one of the previous generations of performers (who had to spend 2 years prone in a cast after a fall which broke her pelvis), took pictures of me with one of the two 9 month old tigers. They've had them since they were tiny babies, and they are incredibly social. Very incredible to be near.